Brave Fencer Musashi (ブレイヴフェンサー 武蔵伝, Bureivu Fensā Musashiden, "Brave Fencer: The Legend of Musashi") is an action role-playing video game developed and published by Square in 1998 for the PlayStation home console. The game involves real-time sword-based combat in a 3D environment; it also features segments of voiced over dialogue and role-playing game elements such as a day-night cycle and resting to restore energy. The story follows Musashi, a young swordsman who is summoned to a parallel world to defend Allucanet Kingdom from the Thirstquencher Empire. He searches for the Five Scrolls, which can enhance the powers of his sword, while interacting with people from Allucanet and a nearby village. Development began in early 1997, and was directed by Yoichi Yoshimoto, produced by Yusuke Hirata, and scored by Tsuyoshi Sekito. The game was a departure from Square's previous role-playing video games, which brought the team several difficulties during development. The game received positive critical response; reviewers praised the graphics in comparison to other similar games of the time, and found the gameplay, especially the action elements, very compelling. Musashi received a sequel in 2005 for the PlayStation 2 under the name of Musashi: Samurai Legend. Gameplay of Musashi in evening as described in the bottom right. The left bottom bar shows Musashi's health points as well as his "Bincho Energy." Musashi is an action role-playing game, in which the player fights against enemies with a sword in action-based combat, with some role-playing elements. The player controls the titular Musashi, who fights a variety of enemies using his swords Fusion and Lumina and searches for five scrolls which will increase Lumina's strength and grant him new abilities. There are also several minigames and puzzles scattered throughout which must be completed to advance the plot. The two swords he uses have varied abilities and uses. Fusion, which resembles a katana, is used to chain rapid combo hits together and can also be used to absorb Bincho energy, which is a type of magical point system that controls how many spells a player can cast and how quickly, or absorb an enemies' skill. The other sword is Lumina, which cannot be effectively used in combos by itself; instead, it can be imbued with elemental properties from Scrolls. Lumina is primarily offensive but in combination with the five elemental scrolls, it gains new skills. The two swords are often used in conjunction with certain techniques which are granted by various rescued townsfolk. The game features an in-game clock and day-night system that affects the townsfolk and some of the creatures in the field (namely, the Minku - creatures from whom Musashi can obtain berries to increase his overall health stat), as well as forcing the player to pay attention to Musashi's fatigue rating that goes up over time with lack of sleep, which as the name implies will have a deteriorating effect on his combative ability. The player can either go to an inn to recover Musashi's health or make Musashi sleep outdoors without a full recovery and with danger he may be attacked by enemies. To pass time, the player may also opt to collect the various action figures -which resemble more detailed models of nearly all the characters and monsters- available at the town toy store which stocks new items at the start of every chapter. Along the way, Musashi obtains parts from the Legendary Armor which allow him to perform actions such as climbing or performing double jumps. A boy known as Musashi, reincarnated from the legendary Brave Fencer Musashi who saved the Allucaneet Kingdom from a monster called the Wizard of Darkness 150 years before, is summoned to Allucaneet by its ruler Princess Fillet to save it from the invading Thirstquencher Empire. Musashi is given the blade Fusion, and is charged with the task of obtaining Brave Fencer Musashi's sword — Lumina, the Sword of Luminescence — before the Thirstquencher Army does. Although Musashi has no intention of saving the kingdom, he agrees to do so in order to return to his homeland. After Musashi recovers Lumina, he finds that most of the people from the Allucaneet kingdom, including Fillet, have been kidnapped by the Thirstquencher Empire. In order to rescue all the residents from Allucaneet and defeat the Empire, Musashi starts searching for the Five Scrolls; each one holding an elemental power able to greatly augment the sword Lumina's powers. With help from the treasure hunter Jon, Musashi finds the Earth Scroll and defeats its crest guardian. After its defeat, half-vampire and half-zombie creatures known as Vambees appear in the nearby village. While searching for a way to stop the Vambees, Musashi finds the Water Scroll and defeats its crest guardian in the basement where the Vambees originate. While Musashi searches for the Fire Scroll, Musashi's rival, Kojiro, kidnaps Princess Fillet and uses her as a hostage to force a battle with Musashi. Kojiro is defeated and Fillet is then rescued. Musashi then searches for thieves from the Thirstquencher Empire and makes his way to the next crest guardian. It is then revealed that Princess Fillet is actually one of Thirstquencher's thieves disguised and that the real Fillet, which is still in their hands. Musashi then continues his journey, finds the Wind Scroll, and defeats its crest guardian in an ants' nest. After finding the fifth and final Scroll, the Sky Scroll, Musashi discovers Thirstquencher's base, a floating ship known as the Soda Fountain. Musashi attacks the base and defeats the Sky Guardian. Thirstquencher's leader, Flatski, forces Musashi to give him Lumina in exchange for the Princess, and frees the Sky Crest. However, this unleashes the Wizard of Darkness, who was sealed within Brave Fencer Musashi's sword Lumina the entire time. It is also revealed by Jon that the original Brave Fencer Musashi sealed The Dark Wizard within the sword. Furthermore, it was Brave Fencer Musashi who entrusted the crests to the crest guardians to prevent The Dark Wizard's seal within Lumina from being broken. In effect, the present Musashi's quest merely aided The Dark Wizard's revival. Musashi recovers Lumina and uses it to defeat The Dark Wizard. After returning the Princess to Allucaneet Kingdom, Musashi takes Lumina to the place where he found it. Executive producer Hironobu Sakaguchi stated that the idea for the game first came up in February 1997. The original idea for Brave Fencer Musashi was having Miyamoto Musashi fighting in an alternate world from where he belonged. While the game was conceptualized as action-oriented, Musashi was originally meant to be a wanderer. However, he was later changed to an itinerant Samaritan in order to have him interacting and helping other characters. During development, the team used an action base which was crucial to the game's fighting mechanics. Director Yoichi Yoshimoto was focused on the game's fully polygonal aspects that were a departure from Square's previous works. The development team prioritized the movement of polygons in real time and how light affected their appearance. Climactic battle between Musashi Miyamoto (top) and Kojiro Sasaki (bottom). The character, Kojiro, was based on the Japanese swordsman, Kojiro Sasaki. Both Musashi and Kojiro shared a lengthy account of rivalry, hence the same frictional relationship that was referenced between the two inside the game. The legend says the two swordsmen set up to duel each other. However, Musashi reportedly arrived several hours late to purposely anger Kojiro and his supporters. Another nod to Kojiro and the legendary duel is when Musashi found him and Princess Fillet on the shores of the Island of Dragons. This loosely referenced Ganryu Island, the appointed location were the long-time rivals held their famous duel. When developing the characters for the game, Sakaguchi did not have a positive opinion of how popular the game would become. However, after the staff designed the graphics and the gameplay, he was surprised by the work, commenting that it was more interesting. The characters were designed by Koji Matsuoka and illustrated by Tetsuya Nomura. When the game was localized for an English release, translators had to change alcohol-based names with soda-pop names due to problems with rating boards. This resulted in several jokes being lost in translation. 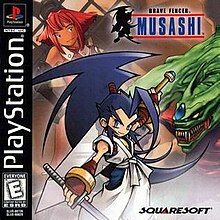 The game's English title was changed from "Brave Fencer Musashiden" to "Brave Fencer Musashi" in order to avoid confusing non-Japanese players about the title character's name, as "Musashiden" means "Musashi's story". The game's musical score was composed and produced by Tsuyoshi Sekito, who had never previously worked with Square. The Brave Fencer Musashiden: Original Soundtrack was released by DigiCube in Japan on July 23, 1998; it consists of 78 tracks spanning two compact discs in a boxset. Brave Fencer Musashi was originally released in Japan on July 16, 1998. It was re-released on June 29, 2000 as part of Square's Millennium Collection along with merchandise including postcards, a combination camera and cellphone strap, a handy strap, and keychain fobs. Another Japanese re-release was for the PlayStation Network on July 9, 2008. In the North American market, it was packaged on October 31, 1998 with the PlayStation 1998 Collector's CD Vol.2, which contained a demo of Final Fantasy VIII. A simplified Japan-exclusive mobile phone adaptation retitled Musashi: Mobile Samurai was released in 2005. After the release of the game, plans were made for a sequel, but were then delayed for years. A PlayStation 2 sequel, titled Musashi: Samurai Legend, was developed by Square Enix and was released worldwide in 2005. On July 16, 2018, Square Enix released a montage video celebrating the game's 20th anniversary since its release. Brave Fencer Musashi sold approximately 648,803 copies in Japan during 1998, making it the 17th best-selling game of the year in that region. The game was given a 32 out of 40 by Famitsu magazine. The game received positive reviews from critics, with Metacritic giving it an 81 out of 100. GameSpot reviewer James Mielke praised the graphics, calling them "very well done" and superior to other Square RPGs of the time. IGN and GamePro's reviews by Randy Nelson and Air Hendrix, respectively, similarly praised the game's "excellent visual design". GameSpot and GamePro reviews also praised the voice acting quality, while Nelson noted the "stellar soundtrack" but found the voice acting to be annoying. The gameplay was also positively received; for example, Hendrix from GamePro shared his opinion that the game did well with management of the game's time. Nelson and Hendrix from IGN and GamePro both emphasized their enjoyment of the game's action elements. GameSpot, while feeling that the action elements were the primary focus of the game, still liked the wide variety of role-playing elements present. Nelson from IGN, however, wished that the role-playing elements had been reduced even further in favor of the action parts of the game. All three reviewers compared the game to The Legend of Zelda, such as Mielke from GameSpot who had discussed the game to release as a direct competitor to that series. Both GameSpot and IGN felt that the comparison was invalid, as Musashi focused much more on action than role-playing, resulting in a game that was not a direct competitor at all. ^ Brave Fencer Musashi Official Strategy Guide. Bradygames Strategy Guides. 1998. p. 18. ISBN 978-1-56686-832-7. ^ Brave Fencer Musashi Official Strategy Guide. Bradygames Strategy Guides. 1998. p. 20. ISBN 978-1-56686-832-7. ^ a b c d e f Hendrix, Air (November 24, 2000). "Brave Fencer Musashi". GamePro. Archived from the original on December 5, 2008. Retrieved December 14, 2015. ^ Brave Fencer Musashi Official Strategy Guide. Bradygames Strategy Guides. 1998. p. 23. ISBN 978-1-56686-832-7. ^ Brave Fencer Musashi Official Strategy Guide. Bradygames Strategy Guides. 1998. p. 14. ISBN 978-1-56686-832-7. ^ a b IGN staff (March 9, 1998). "Brave Fencer: The Series?". IGN. Archived from the original on March 2, 2012. Retrieved January 12, 2009. ^ IGN staff (March 12, 1998). "Musashiden Interview Part 2". IGN. Retrieved July 20, 2013. ^ Miyamoto, Musashi. "MUSASHI MIYAMOTO | Duel with Sasaki Kojiro". www.musashi-miyamoto.com. Retrieved March 6, 2018. ^ "8 Legendary Duels". HISTORY.com. Retrieved March 6, 2018. ^ Fenlon, Wesley (April 28, 2011). "The Rise of Squaresoft Localization". 1UP.com. Archived from the original on November 8, 2012. Retrieved July 20, 2013. ^ "Brave Fencer Musashiden Name Change". RPGamer. Archived from the original on August 19, 2014. Retrieved July 20, 2013. ^ a b Gann, Patrick. "RPGFan Soundtracks - Brave Fencer Musashiden OST". RPGFan.com. Retrieved December 20, 2008. ^ a b "Brave Fencer Musashi release dates". GameSpot. Archived from the original on November 30, 2010. Retrieved August 24, 2009. ^ Koeppel, Christopher (July 18, 2000). "Square Millennium Collection 2". RPGamer.com. Archived from the original on January 13, 2009. Retrieved December 20, 2008. ^ Frank Caron (July 9, 2008). "Curses: Japan gets more Square-Enix PSX loving". Ars Technica. Archived from the original on August 4, 2008. Retrieved July 9, 2008. ^ Score, Avery (March 21, 2005). "Musashi: Mobile Samurai for Mobile Review". GameSpot. Archived from the original on June 4, 2010. Retrieved December 20, 2008. ^ Alfonso, Andrew (May 13, 2004). "E3 2004: Musashi Samurai Legend - Interview". IGN. Retrieved July 20, 2013. ^ White, Lucas (July 16, 2018). "Square Enix Releases Awesome Brave Fencer Musashi 20th Anniversary Video". PlayStation Lifestyle. Retrieved July 16, 2018. ^ a b "Brave Fencer Musashi". Metacritic. Retrieved August 22, 2009. ^ a b c d e f Mielke, James (August 5, 1998). "Brave Fencer Musashi Review". GameSpot. Archived from the original on September 18, 2015. Retrieved August 22, 2009. ^ a b c d e f Nelson, Randy (November 11, 1998). "Brave Fencer Musashi review". IGN. Retrieved August 22, 2009. ^ a b Chinn, Marty (June 23, 2000). "Famitsu Top 120 PlayStation games". Gaming Age. Archived from the original on June 5, 2011. Retrieved December 20, 2008. ^ "Sony PS1 Japanese Ranking". Japan-GameCharts.com. Archived from the original on September 24, 2009. Retrieved December 20, 2008. ^ "1998 Top 30 Best Selling Japanese Console Games". The-MagicBox.com. Retrieved January 1, 2009. This page is based on the Wikipedia article Brave Fencer Musashi; it is used under the Creative Commons Attribution-ShareAlike 3.0 Unported License (CC-BY-SA). You may redistribute it, verbatim or modified, providing that you comply with the terms of the CC-BY-SA.